Cap'n's Cabaret #8: iiViva Habana!! ¡Bienvenidos a Cabaret, mis amigos! Today we celebrate in the Caribbean capital of fun and frivolity, Havana, Cuba! Sun, sand, palm trees, sea breeze, music, dance, games of chance, cigars, fun, dames and rum of a thousand shades and flavors! Save for the extreme poverty of the inner ghettoes (ignore those, my friends) it's Paradise Found! The ultimate playground for the world's travelling classes! Yes, our good friend Mr. Siegel has set us up in posh accomodations in old Malecón overlooking the tuquoise sea. Comfortable air travel courtesy of Pan Am's top of the line S-38 Flying Clipper takes us south out of Key West to that most beautiful and culturally rich old port cities in the Americas. The winds are cool, the rum is cold, and the women (and men, for those of that persuasion) are hot! Mr. Siegel's business partners are in good with the local government and run a clean little slice of paradise. There's a reason such American cultural authorities like the great Ernest Hemmingway call this jewel of a city home! And nothing shy of some damnfool thing like a Marxist revolution is going to stop it! 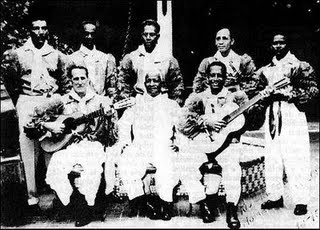 Tonight at the Cabaret we feature the lively sounds of a Habana original, the Septeto Nacional de Ignacio Piñeiro, groundbreakers in the new Cuban music called Son, blending Afro-Cuban beats with traditional Spanish strings. It's the latest craze, and even the most uptight of Manhattan prigs will be swinging their hips when that hot trumpet starts blasting! A couple local boys named Dezi and Benny, working for us in the hopes of catching a break in the music scene, really like the sound, and have hopes to blend it into the similar Afro-Cuban sounds of the rumba and the cha-cha-cha. And to serve with such spicy Cuban sounds, tonight's libation is the truly Cuban taste of the Mojito. Sweet, spicy, bubbly, and intoxicating, the Mojito is a long drink perfect for a night of dancing after a day of loafing in the sun and gorging on spicy beef and rice with fried plantains and yucca root. Muddle mint and sugar with lime juice in a highball glass. Add ice cubes, rum and soda, and stir. Garnish with fresh mint sprigs. My favorite national drink. Unfortunately, Cuba did not obtain its Libre. Thanks, John and you're welcome! Good call on the Cuba Libre cocktail. Thank you for capturing the spirit of old Havana. Your article made me thirsty for a drink that was introduced to me by an ex Cuban Air-force Officer (Under Batista). The world's second most popular drink was born in a collision between the United States and Spain. It happened during the Spanish-American War at the turn of the century when Teddy Roosevelt, the Rough Riders, and Americans in large numbers arrived in Cuba. One afternoon, a group of off-duty soldiers from the U.S. Signal Corps were gathered in a bar in Old Havana. Fausto Rodriguez, a young messenger, later recalled that Captain Russell came in and ordered Bacardi (Gold) rum and Coca-Cola on ice with a wedge of lime. The captain drank the concoction with such pleasure that it sparked the interest of the soldiers around him. They had the bartender prepare a round of the captain's drink for them. The Bacardi rum and Coke was an instant hit. As it does to this day, the drink united the crowd in a spirit of fun and good fellowship. When they ordered another round, one soldier suggested that they toast ¡Por Cuba Libre! in celebration of the newly freed Cuba. The captain raised his glass and sang out the battle cry that had inspired Cuba's victorious soldiers in the War of Independence. And of course, the sound of old Havana revived by Ry Cooder & the Buena Vista Social Club.